Reinstate the disaster exemption from the 2013 legislation, which suspends the requirements for natural disasters within 60 days of the election, within the county covered by presidential or gubernatorial declaration. No need to use provisional ballots here. It would have been helpful in 2016 and 2018. 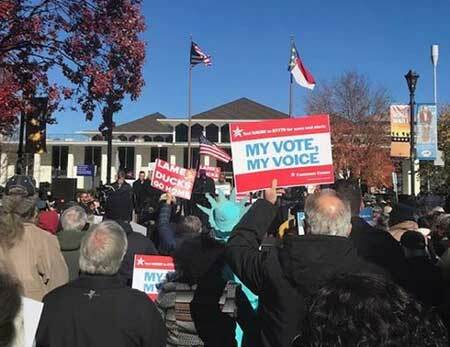 Allow forms of identification such as a N.C. drivers’ license that have been revoked for issues like moving violations or non-payment of fines to continue to be used for voting ID. The bill currently requires license to be valid, hundreds of thousands have been revoked and ongoing litigation has also pointed out racial disparity. This bill is not designed to verify ability to drive. Allow IDs to be used for one year after expiration. People forget licenses expire for some period due to neglect (it’s happened to me twice in 45 years), or may no longer be able to drive. Again, these are identity documents, not driving. No need to force someone into provisional voting with a “reasonable impediment” affidavit. Allowing a permanent exemption at age 70 strike me as a 26th Amendment violation – that amendment forbids discrimination on the basis of age if the voter is 18 or over, let’s reduce the impact by giving more voters a grace period. Allow the 133,000 UNC system student IDs to suffice without some burdensome reissuance process. I can’t imagine anyone forging a UNC system ID in order to break into a polling booth to vote. There is also a high level of security, at most campuses the ID is also used as a debit and credit card and admission to residence halls. Our major financial institutions trust it. Allow the 137,000 community college IDs to be used, similar to UNC system. These are issued by state agencies. In addition to state issuance, if we allow UNC system but not community colleges, there is also a racial disparity as community college students are more likely to be black according to 2014 data I downloaded from the UNC System website. Allow 50,000 private college student IDs to be used under a process certified by the State Board of Elections, but don’t wind up limiting it just to predominantly white institutions such as Duke, Wake Forest, Campbell and Elon. There are six private HBCUs, boxing out small black institutions of higher education would surely be suspect under state constitutional standards I will discuss. The student ID exemptions will greatly decrease the use of time consuming provisional ballots. Again, we are verifying identity, not anything else. Allow those using the reasonable impediment affidavit (under penalty of perjury) to use regular ballots either in all cases, or just in early voting where ballots are retrievable. If we set up an election administration system that is disparate, with black voters more likely to have to use provisional ballots than whites, the disparate nature in itself can be a constitutional violation. I’ve administered provisional ballots for the Wake County Board of Elections at early voting. It’s a tedious, time-consuming process that slows down the voter lines and takes far more staff time. It greatly increases the burden on counties to administer and judge the Provisionals after the election, and distorts election night returns by counting the votes of a disproportionate part of the electorate that is more heavily black nine days later. Reserve the provisional ballot for just those ineligible to use the affidavit. County issuance of IDs is a step forward, but the system appears to shut down issuance for 25 days before the election. Persons may be seeking to obtain last minute ID, or to obtain them to present before the canvass. From a practical matter, suspending issuance during a municipal cycle can leave almost no issuance for months. In Raleigh for example there are separate registration deadlines in September and October, leaving just three days for ID issuance between the deadlines. Likewise in Charlotte there are two separate deadlines in August and October, leaving long periods of suspended issuance. There may be different solutions to this problem. I’m extremely concerned about implementing this by the 2019 municipal election cycle. In 2013 we decided to implement in the 2016 primary, and even then we weren’t quite ready. If we don’t start issuing ID until May 1, 2019, and use the new system in the September 10 primary in Charlotte, Sanford and Murphy, we’d be cutting off ID issuance in mid-August. I suggest implementing in either November 2019 for the end of the municipal cycle of three election dates, OR implement in the March 2020 primary. In my opinion there are three important legal principles involved in any analysis: Coverage under the Voting Rights Act of 1965; Coverage by the 26th Amendment; and Coverage under Article I, Section 19 of the State Constitution. I will largely cover here only Article I, Section 19 and the 26th Amendment. Article I, Section 19 states in pertinent part “Sec. 19. Law of the land; equal protection of the laws.….. No person shall be denied the equal protection of the laws; nor shall any person be subjected to discrimination by the State because of race, color, religion, or national origin.” While passage of the state constitutional amendment means that requiring photo ID is not unconstitutional as being an additional qualification to vote as some State Supreme Courts have held, any requirement in its actual application must not discriminate based on race. Review of this state constitutional provision is entirely in the hands of the State Supreme Court, it is not reviewable in federal court. It’s clear from the evidence in court from the 2013 voter ID bill that blacks were less likely to have proper ID under that bill than whites. While this legislation is certainly broader than the 2013 bill in acceptable IDs, it still in its current form leaves a significant burden based on race. Just as importantly, if we set up an election administration system that is disparate, with black voters more likely to have to use time consuming provisional ballots than whites, the disparate nature in itself can be a constitutional violation. Please cure that disparity, using suggestions I and others will make. The 26th Amendment states in pertinent part: “Section 1. The right of citizens of the United States, who are eighteen years of age or older, to vote shall not be denied or abridged by the United States or by any State on account of age.” Any requirement set up cannot burden persons based on their age. Younger voters are more transient and more likely to move, and thus more likely to have to interact with registration systems than older voters. Younger voters are less likely to have driver licenses than most voters. There are over 320,000 college students in North Carolina, and allowing their student ID to be used to verify identity is common sense. This year saw the greatest increase in youth electoral participation in decades, don’t put a stake through that progress by abridging voting rights based on age.